Select either Everyone, Friends Only or Blocked, and then press B . Private chat is a conversation between you and one other person. No one else can hear or participate in this chat. Your friend can be playing the same game as you, playing a different game, watching a film or listening to music. Connect your Xbox 360 headset or Kinect sensor and then sign in to Xbox Live. 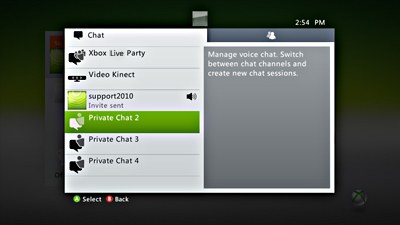 Select an available Private Chat channel and then select or enter the gamertag of the person you want to chat with.